From autumn 2014, LSBU's new schools will fall under academic groupings that are focused upon responding rapidly to stakeholder need, delivering undergraduate or postgraduate education, research, professional development and business support. The university is delighted to announce the appointment of new Deans to lead the activities of each school, each of whom will bring enviable expertise to LSBU as it moves toward this new chapter in its legacy as one of London's largest and oldest universities. In addition, the university has appointed Professor Patrick Bailey to the newly created post of Deputy Vice-Chancellor. 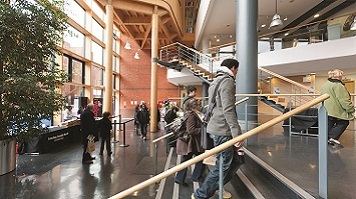 LSBU schools are Applied Science; Arts and Creative Industries; the Built Environment and Architecture; Business; Engineering; Health & Social Care; Social Sciences and Law. Professor Bailey comes to LSBU from Keele University where he was Pro Vice-Chancellor and Executive Dean for the Faculty of Natural Sciences and Professor of Medicinal Chemistry. Professor Bailey has built up a career over more than 30 years in the Higher Education sector, and he is a Fellow of a number of learned societies: the Royal Society of Chemistry, the Royal Society of Edinburgh, and the Royal Society for the encouragement of Arts, Manufactures and Commerce. He is a National Teaching Fellow, and a Fellow of the Higher Education Academy (HEA). Before Keele, he was Associate Dean for Teaching and Learning at the University of Manchester and Chair of Organic Chemistry – a position he also held prior to this at Heriot-Watt University. For his presentations to the general public, Professor Bailey received the Lord Kelvin Award from the British Science Association, and his contributions to education have also been recognised by the Nyholm Lectureship and Medal from the Royal Society of Chemistry. Coming to LSBU from Birmingham City University, Professor Ivey will provide senior academic leadership for enterprise, internationalisation, partnerships, student recruitment and marketing. Educated at the Duke of York's Royal Military School, Professor Ivey started his professional career in 1972 as a marine engineering apprentice followed by service at sea with Texaco. He studied at Sussex University and was awarded BSc. Engineering and Applied Sciences with a Major in Mechanical Engineering and Doctor of Philosophy. In addition to Texaco he has worked for General Electric Aircraft Engines in the US, the Universities of Sussex, Cranfield, Hertfordshire and Coventry, published 100 contributions including books, research papers and patents, directed research studies totalling £13.5M funded by the EPSRC, Rolls-Royce, the UK Government and the European Union, and has supervised 25 Doctoral studies. He holds a visiting Professorship with the Emirates Aviation University in Dubai, is a founding judge for the Tamayouz Award for Iraqi architects and an honorary fellow of the Jordanian Royal Scientific Society. Professor Lee was previously the Head of Department of Life Sciences at the University of Roehampton prior to which he was Deputy Head at Brighton University. He is best known for his research on biomechanics of the spine and ageing and is particularly interested in studying how exercise affects musculoskeletal health in the older adults. He is keen to transfer new knowledge created through research into teaching and enterprise activities and brings substantial international experience with previous roles at the University of Sydney and Hong Kong Polytechnic University. He has been involved in e-learning development throughout his career, and was a recipient of the Bioscience Teaching Development Grant from the Higher Education Academy. In addition, he has served as members of various research grant panels nationally and internationally. In addition to key leadership roles at Middlesex, West of England and Aberystwyth Universities, Professor Janet Jones has experience in industry with 15 years at the BBC, as series editor for 'BBC for Business'. She has worked across a range of financial and political programmes including 'The Money Programme', 'Financial World Tonight', 'In Business' and 'Panorama'. Recent published works include a co-authored book, Digital Journalism (2013), and BBC-funded research identifying how the Corporation could usefully build links with community media organisations. Her current AHRC-funded research investigates the potential of news games and playable documentary to change the way users interact with the news agenda. Professor Egbu was previously Chair in Project Management and Strategic Management in Construction at the University of Salford, where he held the position of Head of Built Environment. He holds numerous Fellowships with professional bodies and has contributed to more than 350 publications including ten books, the most recent being "Knowledge Capture in Small and Medium Enterprise". He has to date obtained research and enterprise income in excess of £25m and brings extensive experience in these areas as well as a strong international dimension. He was a past member of the Peer Review College of both EPSRC and ESRC and is a Visiting Professor to a number of universities in Europe, Africa and Asia as well as a coordinator on a number of Working Commissions. Professor of Mechanical Engineering David Mba was most recently Head of Turbo Machinery at Cranfield University where he led industrially-funded research projects worth more than £5m. Professor Mba has initiated and led the development of numerous academic programmes and CPD courses and has published more than 200 journal and conference papers. In 2010 he was awarded the Ludwig Mond Prize by the Institution of Mechanical Engineers. Externally, Professor Mba has been involved with the International Standards Organisation (ISO) and several national bodies including the British Standards Institute. He is also a fellow of several institutions. Professor Warren Turner will be Acting Dean for the new School of Health of Social Care at LSBU where he was Pro-Dean for the Faculty of Health and Social Care since 2009. He trained as a podiatrist, qualifying in 1989, and since then has worked as a podiatrist in the NHS and in private practice, eventually specialising in the care of patients with diabetes and people with sports/musculo-skeletal injuries of the lower limbs. Warren moved into academia in 1992, working at the University of Northampton's School of Podiatry, becoming Head of School in 1995. He became Assistant Dean of the Health Faculty at the University of Derby in 2001 and moved to London South Bank University before moving to LSBU. He has co-authored three podiatry text books and authored co-authored several journal articles and presented papers at international conferences. In addition to his existing role as LSBU's Pro Vice Chancellor (Enhancement), Professor Molan will be Dean of the School of Business and Acting Dean of the School of Law and Social Sciences. After qualifying as a barrister, Professor Molan taught in higher education for over 30 years in both pre and post '92 institutions, as well as in the private sector. He has been published extensively in the areas of criminal law and public law, and is a member of the Bar Standards Board BPTC sub-committee, non-exec board member of the National Association of Legal Professionals, an Executive Committee member of DASSH-UK (Council of Deans of Arts, Humanities and Social Sciences), a member of Protimos Educational Trust Board, and Chair of the Bar Standards Board's Centralised Examination Board for England and Wales. LSBU Vice Chancellor David Phoenix said: "The creation of seven new academic schools will enable each one to build its own ethos and brand, which we believe will present an attractive proposition to students and businesses who can benefit from our relevant expertise and knowledge to improve their productivity and performance. "The appointment of these esteemed colleagues to lead the schools is a milestone in the story of London South Bank University and I am delighted that they will play such a significant part in our future."